myoldmac.net - Happy Birthday Macintosh! In late 1983, people began seeing odd commercials on TV, commercials which promised a new kind of computer. One that promised (borrowing from the Orwell novel) 1984 won't be like Nineteen Eighty-Four." Commemorating the 29´th Anniversary of the Macintosh on January 24 myoldmac.net is proud to present the first vintage Macintosh Locator App for mobile phones: 68K Finder - Find a Mac - made easy... Read more about the App. The 60-second spot featured a female athlete running through a dystopian landscape inspired by George Orwell's Nineteen Eighty-Four, to throw a sledgehammer at a TV image of Big Brother, meant, in this case, to represent IBM. It ends with the promise, "On January 24th, Apple Computer will introduce Macintosh. And you'll see why 1984 won't be like 1984." The ad, the brainchild of the Chiat/Day advertising agency, played well when shown to an Apple sales conference in 1983. But the company's board of directors balked and ordered the ad withdrawn from its Super Bowl slot. Only the intervention of Steve Wozniak, who said he'd pay for the spot personally if the board refused to air it, saved the day. The Macintosh was the first popular consumer market computer featuring a graphical user interface (GUI). Until then, there had been a few prototype systems, including the Xerox PARC Star and Apple 's own Lisa. The Lisa later resurfaced as the Mac XL for a brief time (it emulated a weak Mac 512K) then was quietly buried in a virtual silicon grave. So what about the Macintosh thing? 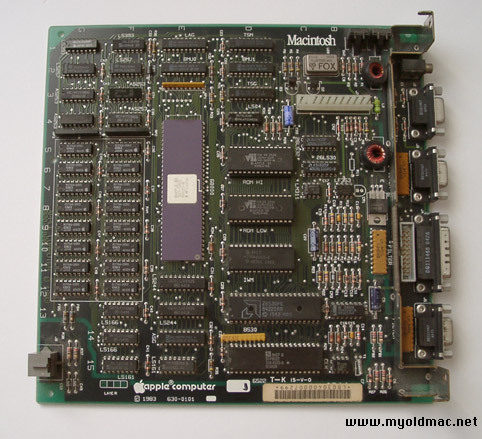 The original Macintosh sold for $2600, with an 8 MHz 68000 processor, 128K of RAM, and a single floppy drive. The only software available when it originally shipped was MacPaint, MacWrite, which were soon followed by Microsoft Basic & Multiplan. The most famous innovation, of course, is the original Mac's graphical user interface, which Microsoft Windows appeared to copy over several generations. Microsoft, which denied this from 1985 on, paid Apple Computer an undisclosed sum in 1997 to end allegations that it had poached Apple. Never mind that Apple was itself accused of poaching the interface from Xerox. The Mac was key in the advent of desktop publishing, too. Wi-Fi, now one of the hottest things in networking, got its start in 1989, when Apple engineers were looking for a way to wirelessly connect the Mac to a printer. Steve Jobs' trademark spat with Cisco over "iPhone" isn't the first time Jobs has brought a product to market with another company's trademark -- he did it with the Mac. According to the biography of former Apple CEO John Sculley, Odyssey: Pepsi to Apple, Jobs launched the Mac in 1984 even though the "Mac" trademark belonged to another company. "Knowing we would face trademark challenges over Steve's decision to launch Macintosh under its original codename, Al (Eisenstat, Apple's general counsel) had argued at full volume that Steve should pick another name for the computer," Sculley writes on page 208. Sculley doesn't name the other company, but says: "Steve prevailed, but it ultimately cost us nearly $2 million in out-of-court settlements." In 1984, Bill Gates claimed that the Macintosh was the only machine that really captured peoples' imagination. In November, Apple buys every advertising page in a special post-election issue of Newsweek. The issue’s final ad is used to launch a “Test ... all » Drive a Macintosh” promotion, in which customers are invited to take a Macintosh home for a free 24-hour trial. About 200,000 people do just that, and Advertising Age magazine names “Test Drive” one of the ten best promotions of the year. Happy Birthday, Mac - © 1994, "Tomorrow is the 10th birthday..."